Casting defect which may occur with all castings, however in particular with castings produced by means of a sand casting process (s. Sand mold, Sand casting). Rough surfaces are visible to the human eye (fig. 1); they mainly occur at sections or spots which were exposed to high thermal load. 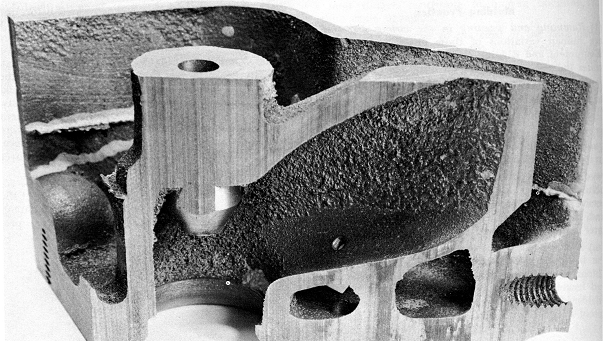 The defect is formed by the rough structure of the casting surface with roughness being of the size of a sand grain. In some cases, there are sand grain enclosures on the casting surface. Roughness is usually no reason for reject; however it constitutes low quality and is hardly tolerated by customers nowadays. For safety components which are subjected to dynamic load, this defect results in reject. Roughness is to be considered as the primary stage of casting defects such as burnt sand, conventional penetration and metal penetration thus providing serious hints for taking appropriate measures. The grain size considerably affects the surface finish of sand castings because larger grain fractions result in rougher surfaces. Figure 2 shows the schematic illustration of the conditions at the metal/mold boundary surface. There is a balance between the capillary forces of the mold material (gas permeability), surface tension, wetting and the metallostatic pressure. If the metallostatic pressure prevails, molten material enters the surface pores. The capillary forces which work against the metal ingress increase with decreasing pore radius. If the metallostatic presseure exceeds the counteracting forces, metal enters the mold through the gaps between the sand grains and may result in penetration once a critical value has been exceeded (penetration pressure). The roughness of surfaces can be determined e.g. by means of the profile scanning process. In this process, the surface of the component is scanned with a diamond tip. The needle movement is recorded inductively. The Rz value of the surface can be directly determined by appropriately filtering the measured electrical signals. The roughness of casting surfaces is a quality feature of the casting (s. a. Surface quality).